Every now and then someone comes up with something fun and exciting that adds a lot of fun to kite festivals. Something that helps kite fliers interact with one another, brings some laughter and excitement to the field, and a bright dash of color! 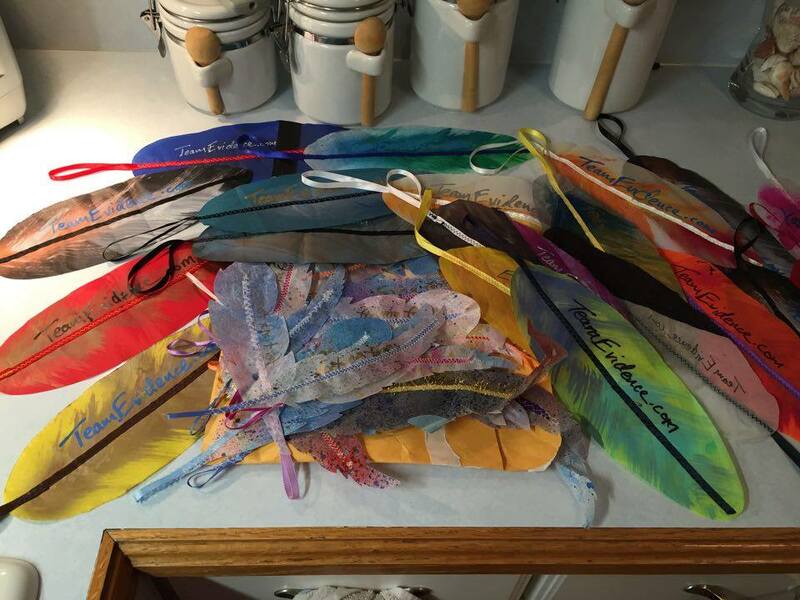 The folks attending Kitemania South in Tampa Bay, FL this year decided to create a ‘feather exchange’. Attendees were encouraged to join the Kitemania Feather Makers Facebook Group and post photos of themselves and their feathers. There were no rules or requirements, no restrictions, and LOTS of encouragement. 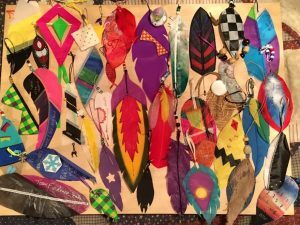 This years feather exchange saw no-sew entries, feathers in the shape of lighthouses and bats, inspiration from favorite TV shows, and some artfully painted, beaded and decorated ones. No two feathers were alike, not were any of the collections. Each person selected and exchanged their own feathers, making for a rather unique plumage that was parts of everyone else yet uniquely their own. Watching the ‘feather-mania’ spread across those attending the event, several folks from out of state that would not be attending decided to gather together some feathers and ship them across country. Perhaps this is a sign of a larger feather exchange at future events? What about a feather exchange at the AKA Convention in Seaside this year?! For more information on the Kiting Tampa Bay club head on over to their website: http://www.kitingtampabay.com/ They host regular meetups, fun-flys, and love to fill the sky with all of the laughter and fun that is kite flying. Soon they will be posting a write up about how their feather makers made their feathers, replete with helpful tips on how to paint, sew, decorate, or embellish. Here are a few suggestions for hosting your own feather exchange at an upcoming event. Get the word out, and get it out early. People will need enough time to create all of their feathers. Create a Facebook Group, or a central digital ‘location’ that people can join and share information For information on how to do this contact the AKA on Facebook, or email the Board of Directors and they will help you. Share your Facebook Group (or other) with everyone. Make sure the festival/event knows about it, and invite everyone you know that is going, and some that are not! Maybe a feather exchange will encourage them to come! Encourage members to design and build feathers how ever they want. 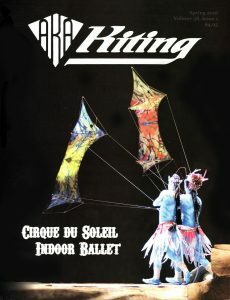 Promote those that want to try a no-sew option, or make a feather out of paper and found materials. Remind them that the one thing all feathers need is a loop for attaching or hanging, and that all the feathers should have their name on them. Encourage members to post photos of themselves and their feathers as they build them. When people see others doing it, they may be inspired to make more of their own. Often times feathers can become a ‘family affair’, one cuts, another sews, and yet another signs them! As the event nears, remind everyone to pack at least 2 carabiners. One for holding the ones they are giving away, and one for the ones they collect. Encourage members to post a photo of their collection after the event. It is nice to look at how each persons collection is different yet has similar feathers to other members. Have fun! Because, when all is said and done, these are just feathers, and just a little bit of fun. BONUS POINTS!!! – Some feather makers take their collection from the event and create something fun and new. What about a banner, or a new kite?